Plastic in our oceans. 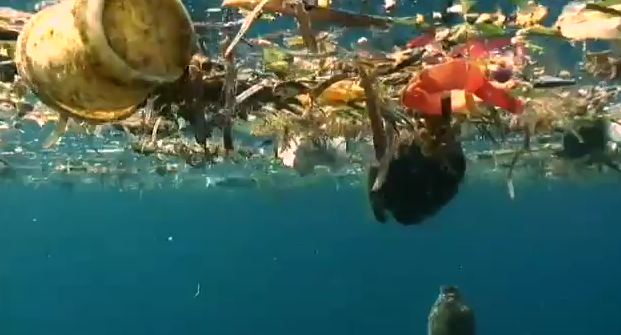 Plastic swirls, double the size of Texas, in our oceans. My husband and I do not have TV at our house, (we just watch Netflix!) so I am going to attribute that to the reason why I had no idea this was such a huge issue. However, I think what has me the most unsettled is that we are not doing anything dramatic to fix this devastating problem. Please educate me if I am mistaken, but I have heard nothing of large-scale attempts to fix this catastrophe. To me, it seems silly that the government is not devoting funding to an issue of this magnitude. When birds, fish, and other organisms are ingesting plastic toxins, they are entering the food chain that we happen to be at the top of. Therefore, these plastic toxins will eventually make their way into our digestive track. I think that alone, warrants our attention. Not to mention the countless deaths and deformations of wildlife in the surrounding areas. My main quest with this post is to get you inspired to help be a part of the solution to this problem, rather than be overwhelmed by it, causing you to become apathetic. Ok, so let’s break this up into three easy parts to keep you on track. Where is all this plastic coming from? How much is there in the Oceans? What can I do about it? Bottled water definitely seems to receive the most flack in terms of being wasteful, but there are many other types of plastics that are making their way into the oceans. According to Eco-activist David de Rothschild, there are four main pollutants; plastic bags, Styrofoam cups, Styrofoam containers and soda bottle lids. Other pollutants include, toys, product packaging, cheap holiday decorations, beverage cans, chemical containers, milk jugs, and basically any other plastic items you can think of. Where does all this plastic come from? US! This is an entirely man-made problem, which also means that it can be an entirely man-made solution. How much is there in the Oceans? Get ready because this number may shock you. While some assumptions had to be made to come to this number, “Stiv Wilson of the ocean conservation group 5 Gyres has made a first attempt to tally how much plastic is in the global ocean. The number he comes up with is staggering: he conservatively estimates there are 315 billion pounds of plastic in the oceans right now.”(1) That number is huge, despairingly huge. Let’s take a look at the world map to see where many of the plastic swirls are currently. Most experts agree that there are 5 main swirls in the ocean. 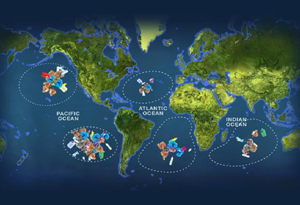 The Pacific ocean garbage swirl, or gyre, is the largest, but the others will continue to grow if our consumption of plastic does not decline. Reduce, Reuse, Recycle, and REFUSE to buy single use plastic items as often as possible. In the market today, there are other options available. If we begin to refuse buying single use plastic containers, the market will respond to the demands and offer more environmentally friendly options. You can also check out the below links to see how you can get involved. The main task is to get more visibility to this issue. Make sure you share some of the information you learned from this post, or from one of the organizations posted below, with a friend or family member. This is a problem we created, but it is one we can most certainly fix.